We are proud to announce that on August 17th we won the British Firework Championships in Plymouth. The event is the most prestigious in the UK and attracts over 200,000 people bringing an estimated £4million into the local economy. 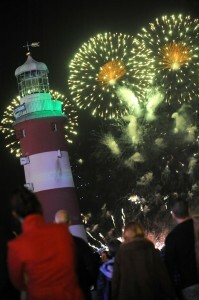 The event, which took place over two nights at Plymouth Hoe is the 15th to be held in the city. MLE Pyrotechnics beat off stiff competition from Skyburst, Fireworx Scotland, Nemesis, Celebration Fireworks and Highlight Pyrotechnics to become the well deserved winner. This is the second time the company have been awarded first place at this prestigious event which attracts around 200,000 spectators. MLE had a team of 14 people working on the preparation and rigging of the display which took all day to complete. MLE Pyrotechnics is the UK’s only manufacturer of digital computerised firing systems. The company’s displays use a technique called ‘distributed processing’ which makes it faster and more reliable than conventional manual firing systems, and allows firing to take place synchronously from an unlimited number of locations. Using this advanced technology enables MLE’s technicians to create a display with much more intricate patterns across the sky. It certainly impressed the spectators at this year’s fireworks championship and MLE are set to be a strong contender in next year’s event. The next competition event for MLE Pyrotechnics will be at The Macau International Fireworks Display, one of the world’s leading firework competitions with over 100 competing companies. The event starts on September 10th and concludes on October 1st.